Colour to order Flameboyant / Red/ Green/ Blue Metallic Shades. Watson Group has come a long way since it was established (its inception) in 1959 as an engineering unit to manufacture bicycle components. 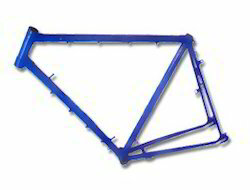 Over the years it has maintained a steady growth to achieve an enviable distinction of being the most prefered OE supplier of bicycle components to all the bicycle manufacturers in the country. Spread over a covered area of 100,000 sq. ft., it maintains a lead in the manufacture of Cold Forged Bottom Bracket Cup and Axle, Cold Forged Head fittings, Bicycle Chain, MIG welded Bicycle Frames and rear carriers. In the last couple of years, as the bicycle industry has become increasingly competitive, "Watson" has made significant efforts in modernising its manufacturing capabilities in Cold Forging Process, Precision machining, Heat Treatment, Surface Plating and MIG welding/ fabrication works. As an ISO 9001:2008 organisation, Watson is a team of highly professional engineers, managers and workers who work continuously along with each other to attain high levels of competitiveness, to better its production systems and to furthur reduce its lead time in developing new products. Over the next decade it plans to leverage its existing manufacturing capabilities to widen its customer base by catering to industries in the field of automobiles, electricals, defence and heavy equipment. As an ISO 9001:2008 organisation, Watson is a team of highly professional engineers, managers and workers who work continuously along with each other to attain high levels of competitiveness, to better its production systems and to furthur reduce its lead time in developing new products. Over the next decade it plans to leverage its existing manufacturing capabilities to widen its customer base by catering to industries in the field of automobiles, electricals, defence and heavy equipment. As an ISO 9001:2008 organisation, Watson is a team of highly professional engineers, managers and workers who work continuously along with each other to attain high levels of competitiveness, to better its production systems and to furthur reduce its lead time in developing new products. Over the next decade it plans to leverage its existing manufacturing capabilities to widen its customer base by catering to industries in the field of automobiles, electricals, defence and heavy equipment. As an ISO 9001:2008 organisation, Watson is a team of highly professional engineers, managers and workers who work continuously along with each other to attain high levels of competitiveness, to better its production systems and to furthur reduce its lead time in developing new products. Over the next decade it plans to leverage its existing manufacturing capabilities to widen its customer base by catering to industries in the field of automobiles, electricals, defence and heavy equipment. As an ISO 9001:2008 organisation, Watson is a team of highly professional engineers, managers and workers who work continuously along with each other to attain high levels of competitiveness, to better its production systems and to furthur reduce its lead time in developing new products. Over the next decade it plans to leverage its existing manufacturing capabilities to widen its customer base by catering to industries in the field of automobiles, electricals, defence and heavy equipment. As an ISO 9001:2008 organisation, Watson is a team of highly professional engineers, managers and workers who work continuously along with each other to attain high levels of competitiveness, to better its production systems and to furthur reduce its lead time in developing new products. Over the next decade it plans to leverage its existing manufacturing capabilities to widen its customer base by catering to industries in the field of automobiles, electricals, defence and heavy equipment.